MEXICO, NY – Former modified, late model, supermodified, and Silver Crown driver Billy Whittaker returns to Oswego Speedway, but this time, not behind the wheel. “Billy Whittaker Cars and Trux” has joined the JJ Andrews / Team Tapout #93 as a major sponsor for the 2013 season. “Although I don’t have time to get behind the wheel these days, I am still happy to be a supporter of auto racing, and J.J.’s small block supermodified team,” said Whittaker. Whittaker is known for excellent quality vehicles, serviced on the premises, that can be purchased for as low as $30 a week (cars) or $50 a week (trucks). And they have financing for everyone. Log on at www.billywhittakercars.com, call 315-668-CARS, or stop by at our recently expanded location at 309 U.S. Route 11, Central Square. J.J. Andrews has been racing in the small block supermodified division since 1997, and currently sits in 5th place in all-time points. 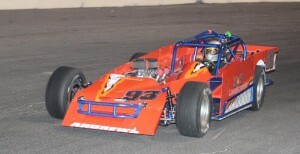 Andrews drives the Jason Simmons owned Team Tapout #93, Hedger Chassis. Andrews won on opening night in 2012 in his first ride ever for Team Tapout, and finished 9th in the overall point standings. “With a fresh car, fresh Morrison power plant, and now the great partnership with Billy Whittaker for 2013, I can’t wait to get the season started,” Andrews said. Oswego Speedway runs Saturday nights, starting May 4 until mid-September. With pre-season registration the highest it has been in years in both the supermodified and small block supermodified divisions, excitement for the 2013 season is at a fever pitch. Friends and fans are invited to attend the JJ Andrews / Team Tapout 93 FUNdraiser on April 28 at noon at Thunder Road Bar and Grill, just outside of the first turn at Oswego Speedway. Raffles, door prizes, a great feast, and entertainer JP Shaggy will make it a great day.